Realistic New Year's Resolutions, Meditation, Etc. So what are the best personal growth New Year’s Resolutions? The best or most effective New Year’s Resolutions are realistic and paired with non-judgement and a little creativity so you can regroup if and when your determination fades. Late December and all of January and even February to a lesser extent have a group optimism about personal growth and change which can be uplifting and make it easier for someone to get motivated to change. I discuss how to be realistic with your goals and resolutions further down in this post. Whether you like New Year’s Resolutions, or prefer just to make personal growth goals and not attach them to a specific year, having growth goals can be very helpful. My Make a List page lists sample personal growth goals you might like. 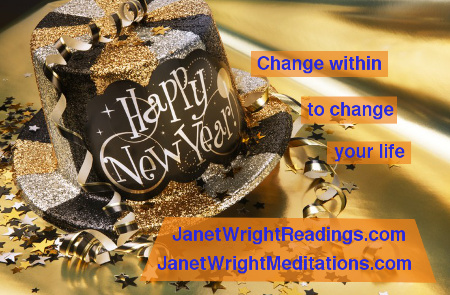 Personally I just do ongoing personal growth goals, but I do really like feeling the mass optimism pro-change energy that comes with New Year’s and January each year. Is your New Year’s Resolution to meditate every day, or more often? Meditation is one way to give yourself your own motivation and momentum. If you wanted to get yourself comfortable with short regular meditations then you’d have an extra tool to inspire you when the rest of the world goes back to life as usual in February or March. Of course I have a lot of very approachable personal growth meditations here on my site under the Meditations menu. The most popular are my shorter meditations. The shortest is 9 minutes long and the longest are 1hr+. Of course you can have all sorts of New Years Resolutions other than meditation, but actually meditation can help with those too. For example I used my 15 min Confidence meditation for “confidence in making soup” about five or six times to get myself over a three year slump of letting my crock pot gather dust. I used the Confidence meditation for “confidence in working out” so that my awful childhood gym experiences didn’t get in the way of me using our home exercise machine regularly now. Clients have used the Confidence meditation for confidence in moving across country, confidence in an upcoming interview, etc. Clients use the Peace Now 12 min meditation to help with peace of mind, and the 7 Chakras Meditation/Healing 28 min meditation to help with being more present overall. The Home Energy Clearing version 2, 15min meditation is great for energy clearing your home, and sometimes even helps make it easier to physically clean your home too. All my meditations have descriptions posted plus there is a discussion page about my meditation recordings too. Also of course another tool to find inspiration is getting a phone reading with me. I am a personal growth psychic reader & healer, so I specialize in helping people with their personal growth goals year round. We can look at your goals, how you’re doing with them, if/how you are stuck, what to do about it, etc. For more info on my readings you can see the menu Phone Readings on this site. So how can you be realistic about your New Year’s Resolutions? Be prepared to learn more about yourself, nurture yourself, heal and recenter if you are not making consistent progress. One metaphor the angels often show me when I read a client is to try to imagine being a really nice 2nd grade teacher to yourself- patient, encouraging, understanding, supportive. Give yourself a gold star for trying, tell yourself you can try again tomorrow, and even be prepared to down-size to a smaller goal if you get too stuck on your initial goal or resolution. The mean-teacher way of self-motivating usually does not work, since you may be/become stuck due to being overwhelmed and an angry judgmental push-push attitude towards yourself could just make things worse. Also be ready to get help if you are totally unable to change. You are not alone, and you may just need a little professional help from someone like me to get you moving forward. Becoming self-motivated is wonderful but remember you can get help with that in the meantime. Of course your angels can always help you - for free of course! You could try an affirmation like “I am open to Divine Assistance. I will let my angels help and guide me today, and tonight in my sleep.” Affirmations are like micro-meditations, and generally a little more effective if you are more present when you say them. So connect with your body, wiggle your toes & feel that, and send the idea of this affirmation to every cell of your body, and your whole energy system including the energy bubble around you called your aura. Many people think upwards when they think of angels, which makes them less body-connected or less present. Your angels are around you so no need to think upwards. If you tried my two grounding videos on youtube then you could also ground yourself as you think of your affirmation. No money? I have at this point about 42 free videos on my youtube channel Janet Wright Readings where you can learn about your energy, learn how to ground and center and heal your chakras, aura, etc. You can start with my two grounding videos. This would help you to feel better and be more at your best. Also I have free meditation recordings here on my website. The Self-Acceptance 16min recording or the Peace Now 12 min recording are great starter meditations that are free to download here on my site under Meditation, Free Meditation Recordings. Do you have any questions or comments about New Year’s Resolutions in general, or a specific goal or resolution? Do you create New Year’s Resolutions or just make ongoing personal growth goals? Have you ever felt that wave of mass positivity in January? Post your feedback, questions, or comments here and I will post a reply. You can post anonymously too.